Permanent slides or specimens meant for long-term viewing are not known from the seventeenth century (1600's). The earliest extant slides date from the eighteenth century (1700's), but relatively few of these are known and only a few are in this collection. 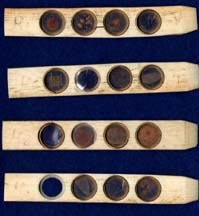 The earliest known slides were simply pieces of bone, ivory or even wood with a specimen; the earliest examples in this collection date to the eighteenth century. These slides had specimens simply mounted either on top, or (later) for transmitted light, between two pieces of mica. Later, glass slides were used. Once glass slides became used for this purpose, mica coverslips were used with glass slides, or two slides were simply used with the specimen in-between. Some of these double-slides are in this collection. When glass coverslips were finally used, their thickness varied greatly; for sometime, the use of mica as a coverslip overlapped with the use of glass slips. Much later as methods to produce them became less complicated, standard thicknesses became available. In rough order of appearance, specimens were therefore first mounted either in individual cells or bone sliders; initially opaque, then also for transmitted light. Next came glass slides but of variable size and thickness; specimens were first opaque and then seen between two slides or with mica coverslips at first; later as the process for manufacturing thin glass became cheaper, glass coverslips finally appeared. Slide size initially varied but the the standard 1 x 3 inch slide eventually became the usual, though occasional idiosyncratic mounts persisted, either by certain mounters, or for certain purposes. Todays standard is the 1 x 3 inch slide (25 x 75 mmm), usually 1 mm thick. Common thicknesses of coverslips today are number 1.5 (0.17 mm thick) and number 1. In the nineteenth century however the thickness of the coverslips varied so much that for high power high resolution work, a coverslip gauge was sometimes used to measure the thickness and adjust the high power objectives. For a detailed history of this topic the reader is referred to Dr Brian Bracegirdle's excellent books: 'Microscopical Mounts and Mounters' Published by the Quekett Microscopical Club in 1998, and, 'A History of Microtechnique: the evolution of the microtome and the development of tissue preparation,' Second Edition, 1987, Science Heritage, Lincolnwood Il 1987. Both are available from Savona Books in the UK and the Gemmary in the USA. The reader is also referred to websites devoted to the topic: A Cabinet of Curiosites and Historical Makers of Microscopes and Microscope Slides and the links from these sites. In general, Dr Bracegirdle's book on slides gives excellent information, but since it was published it has inspired many to delve further and as a result much more has been learned, sometimes revealing new information which may change or add to Bracegirdle's original information. 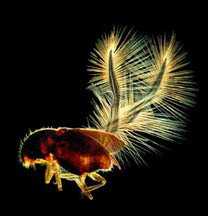 Much of this is published in the Journal of the Quekett Microscopical Club, and also various online sources. Whenever I am aware of this information, I have incorporated this information into this site. If I have made an error, or if you have different information, please contact me. This collection contains microscope slides which date from the 18th,19th and 20th centuries. A few of the specimens in this collection were mounted on bone 'sliders.' A few of the idiosyncratic round Ypelaar-type mounts are also in the collection. Because of the the thousands of slides in this collection, not every slide can be shown or even listed, but as feasible they will be added as time permits. An effort will be made to include the most important and most interesting slides first. Included are slides from the collection of a Mr W. Rutt which were purchased intact in their original cabinet along with Mr Rutt's little notebook and accompanying papers. A founding member of the Hackney Microscopical Society, his collection contains mounts of the period, frequently dated to the 1850's. Among the mounts are some by the hon. secretary of the society, Freeman C.S. Roper, a contributor to many scientific articles relating to microscopy during the second half of the 19th century and the author of one of the earliest bibliographies of books on the subject of microscopy. Another biologist whose slides were also found in Rutt's cabinet was Mr R.S. Boswell, whose name is also found in publications of the time and was also listed as a supplier of slides by Mr Rutt. Along with slides by William Darker and also by Cornelius Poulton, slides by the better known maker C.M. Topping are also plentiful in the collection as are the typical deep-well corrosion slides of Alexander Hett, and Microphotographs by J. B. Dancer. Some slides were likely prepared by Rutt for his own personal use, and still others may be by makers not yet firmly identified. The slides by Poulton are unsigned but can be identified by the letter accompanying the collection. This letter signed by Poulton, referring directly to the numbers on the slides, lends further support to Howard Link's original idea that similar numbered slides were by Poulton (based on a trade label found on the back of one). 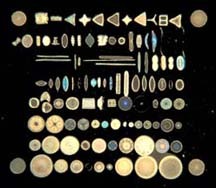 It is interesting to note that a few of the slides in this collection were more of a 'souvenir' or collector's item rather than of high value as a microscopical specimen. These included a C.M. Topping slide of the beard of 'Thomas Beaufort, second son of John of Gaunt-buried 1428, exhumed 1772.' This slide is now part of Howard Lynk's collection and can be seen here. Another example is a slide of 'mummy cloth.' All in all, Rutt's collection, along with the accompanying documents, give some insight into the amateur microscopists of the 1850's and their sources of slides. When time permits, a dedicated web page will be published, devoted to Rutt's Collection. Click on a picture to see more images of slides and details. Click on a picture to see more imagees of slides and details.